In one of the most bizarre girls' championships in Santa Clarita Valley history, Saugus senior Kaylee Thompson came from way back in third to dethroning heavy pre-race favorite Mariah Castillo and freshman ace Hailey Kirsch for the individual title. Her winning mark of 17:41 ranks No. 3 in Central Park course history, only behind former Centurion Samantha Ortega (17:13) and teammate Castillo (17:27). 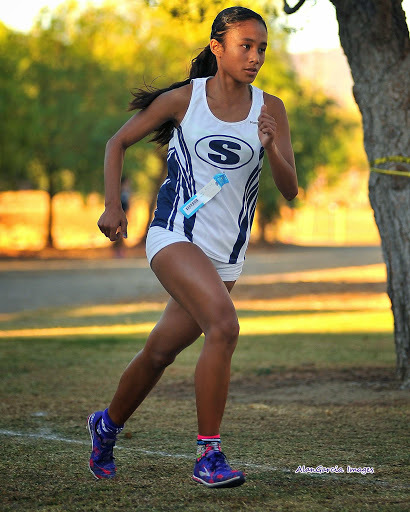 The coronation of Bianca Tinoco's stellar high school career took full effect at the 2015 Foothill League Championships, where the Arizona State University signee snapped Saugus' 11-year streak of individual crowns. Saugus' Kaylee Thompson, Ashley Heys and Sydney Suarez set a blazing pace up front in an attempt to run the kick out of Tinoco, but the Golden Valley standout would not be denied, pulling away and winning in 17:52, No. 4 in Central Park course history. Thompson finished second, with Tinoco's senior teammate, Mykasia Simpkins, running down Heys, who earned her third consecutive top four finish of her cross country career, for third. Also earning All-Foothill League first team honors was Saugus' Suarez and Emma Bahr in fifth and seventh, which helped the Lady Centurions win their 10th straight team crown with just 29 points. West Ranch freshman star Shelbi Schauble completed the All-Foothill League roster in sixth place. After Ryan Tate's brilliant run at Foothill League Meet No. 2, which saw the senior dip under Brian Zabilski's Central Park course record by a fraction of a second (15:04), Tate's cross country career ended with his first championship over the West Ranch trio of Tucker Welker, Hart transfer Preston Pope and Ryan Painter in third through fourth. Welker's runner-up finish marked his third straight top five finish. Seniors Jonathon Bay of Golden Valley and Saugus' Jacob Crosson earned their first Foothill League first team awards, while West Ranch's Jack Arnold completed the All-Foothill League roster in seventh, with junior teammate Justin Sherfey finishing as the Wildcat's fifth scoring runner in 12th place, which helped the program score 28 points and win their first-ever Foothill League cross country team championship. Defending league champion Saugus finished second with four in the top 13 positions. In the final Foothill League race of Samantha Ortega's decorated career, the Saugus junior led from start to finish, winning by 63 seconds. Only Canyon's Kyla Danforth and teammate Ashley Heys, last year's bronze medalist, went with her. Ortega went on to win her third straight championship, the first runner to three-peat since Lauren Fleshman won three in a row from 1996-98, set a new course record in 17:13, and had the biggest margin of victory in league history (1:03!). Danforth paid the price for going out with Ortega late in the race, fading to fourth, as Heys and Jessica Ruiz timed their kicks perfectly to give Saugus a 1-2-3 finish, the sixth time in the last eight years the Lady Centurions have swept the podium, West Ranch's Taylor Hernandez finished sixth with freshman sensation Abby Davis taking sixth in her league championship debut. Team-wise, the Saugus girls, once again, won a ninth consecutive championship. 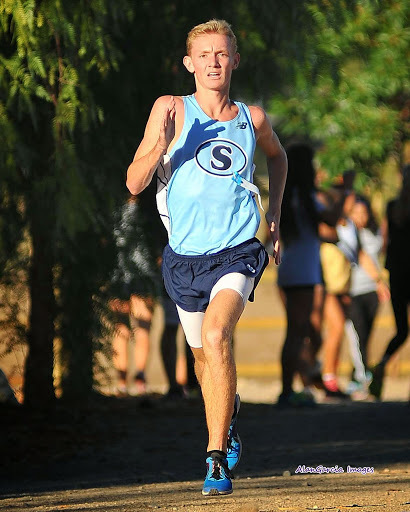 Saugus' Brian Zabilski coasted to his second straight Foothill League crown, winning by 27 seconds over a great field. His winning mark of 15:15 was also the second fastest in Central Park course history, only trailing his 15:04 record set in Foothill League Meet #2. Meanwhile, teammate Ryan Tate pulled away from the West Ranch duo of Tucker Welker and Ryan Painter to claim runner-up honors, which came a year after taking the 2013 frosh/soph finals. Saugus' Tim Broggie and Jordan Serrano finished sixth and eighth, with Hart's Nick Liebmann sandwiched in between the two, to give the Centurions their eighth team championship in nine seasons and the school's 100th Foothill League title. Also: West Ranch's Timothy Sterkel and Canyon's Jacob Velarde joined Saugus' Abby Davis and Hart's Sophia Pearson from the varsity girls final as the four freshmen to earn All-Foothill League honors in 2014. In the girls varsity final, it was Samantha Ortega vs. the clock, although Valencia freshman standout Kaylee Thompson tried going with the Saugus junior over the first 800 meters. Ortega would go to win her second straight individual crown, and Saugus' ninth straight individual crown, in a solo 17:22 effort, five seconds shy of her own course record and 32 seconds ahead of the next finisher. Canyon's Natalie Rodriguez, the runner-up finisher, clocked the second fastest mark in course history, besting Karis Frankian's 17:59 by five seconds, while Saugus' Ashley Heys tied the sophomore record, held by Great Oak's Destiny Collins, for third. In the team battle, the Lady Centurions easily claimed their eighth straight team championship. 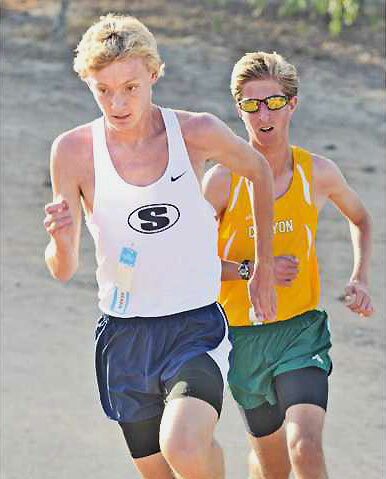 Saugus' Brian Zabilski and Canyon's Caleb McClain, both juniors, had an epic dual through two and half miles last fall, before Zabilski pulled away to win in a course record of 15 minutes, 13 seconds. McClain enjoyed the best performance of his cross country career, taking runner-up honors in a school record of 15:27. After the Cowboy, the Centurions stuffed the finish shoot, placing three in the top four and all five scorers in the top 15 (although frosh/soph champion Ryan Tate's 16:16 performance would have been good enough for 10th in the varsity final). The win gave Saugus its seventh Foothill League team crown in the last eight seasons (its only loss coming in 2011, when Golden Valley went 1-4 at the Foothill League Championships. The highlight of the 2012 finals was Golden Valley's Chelsey Totten vs. Saugus' Samantha Ortega. Two weekends earlier, Totten finished second in the team sweepstakes race at the Mt. SAC Invite in 17:18, while Ortega won a varsity race in 17:26. The match-up was one of the best in league history, as the two, along with Saugus' Abigail Frankian, battled for much of the race. Over the final 600 meters, Ortega, a who had only run seven races in her life before this final, pulled away from Totten to win her first varsity crown in 17:25, a new sophomore course record. Totten, a senior at Golden Valley, took second in 17:36, No, 3 all-time, with the younger Frankian sister finishing a spectacular third in 17:42, a new junior record at Central Park. In the team battle, it was once again Saugus winning its seventh straight league championship. They had all five scorers in the top seven and all seven runners in the top 18, despite missing senior Heidi Hoslet, who won her second junior varsity crown in 18:39, the 12th fastest overall time of the day. the The boys final was one of the deepest in Foothill League cross country history up front with Canyon's Zach Wims, Golden Valley's Nolan Del Valle, Hart's Josh Sherfey, and Saugus' AJ Yarnall and Rodrigo Ornelas battling for the individual championship. It was those five runners battling for most of the race before the Saugus duo of Yarnall and Ornelas, as well as Golden Valley's Del Valle, finally pulled away with 500 meters remaining. In the end it was Ornelas out-leaning teammate Yarnall by two-tenths of a second to give Saugus its third individual crown in five years. 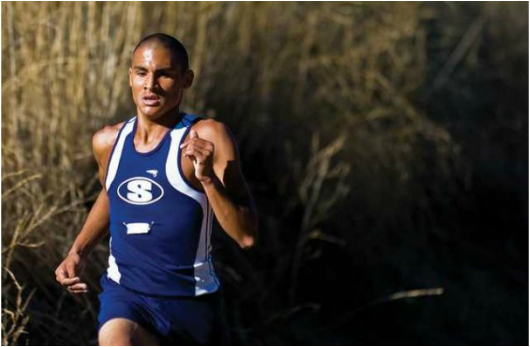 Del Valle, who already had three top eight finishes to his name, finished his cross country league career with a third-place finish, while Hart's Sherfey held off Canyon's Wims, the 3,200-meter bronze medalist, for fourth place. Saugus, who had its five-year streak of Foothill League cross country team championships snapped by Golden Valley in 2011, reclaimed the team crown with four in the top eight and all five scorers earning All-Foothill League first and second team honors. For the fifth consecutive year, the Lady Centurions swept the podium (top three) in the varsity girls final. From the start, Golden Valley junior Chelsey Totten and Saugus seniors Karis Frankian and Jenay Jauregui led the field, despite windy conditions. Halfway through, the Saugus duo pulled clear of Totten and went on to finish first and second, Frankian in a course record of 17:59 and Jauregui in the third fastest mark in course history (18:19). It was senior Jordan McCall, who before the 2011 season only had a 22-minute three-mile personal best, who reeled in Totten in the last 400 meters to take the bronze medal. Totten held on for fourth, the highest finish of her career. In the team competition, Saugus once again dominated, winning their sixth straight league team title with just 19 points and had seven in the top nine fastest performances of the meet (Heidi Hoslet won the junior varsity league championship in an impressive 18:46). The most dominating team performance on the boys side came in the 2011 finals, when Golden Valley swept the top four places and put all seven runners in the top 12. Seniors Kristian Martinez and Juan David Garcia and junior Nolan Del Valle led from start to finish, but it was teammate Carlos Lopez that stole the show, as the senior out-kicked Saugus' AJ Yarnall to finish fourth by the smallest of margins. Hart's Austin O'Neil and Sam Peckham took the final All-Foothill League first team awards. Martinez's individual win of 15:31 was a new course record on the hill course at Central Park. Golden Valley's 19-point win here was their first championship in school history, the lowest boys team score in finals history, and ended Saugus' streak of five consecutive crowns. They would go on to claim CIF Southern Section and state championships that November and finish 12th at the Nike Cross Nationals in Portland, Oregon. In the girls final Saugus senior Stephanie Bulder was the run-away winner, claiming her first individual cross country championship of her career in 18:17, 12 seconds ahead of teammate Danielle Hernando and 14 ahead of two-time defending champion Kaylin Mahoney, who was running just her second race of her senior season (a stress fracture kept her out of competition until the end of October). Mahoney's third-place finish ended an incredible league career, which saw her win the 2007 frosh/soph crown and two varsity championships in 2008 and 2009. Rounding out the top five were West Ranch's Jennifer Owen and Golden Valley's Chelsey Totten. Saugus dominated the team race, puttling seven in the top nine to win their fifth consecutive championship, and went on to have perhaps the greatest post-season run in California state history. The boys varsity winner in 2010 was without a doubt the biggest upset in Foothill League history. Entered in the race was Saugus' Robert Pion, who would go on to finish seventh at the state final three weeks later, Golden Valley's Kristian Martinez, who set the SCV high school junior record at Mt. SAC (15:02) two weeks earlier, Hart's Sam Peckham, a two-time Foothill League bronze medalist over 3,200 meters, Valencia's Falco DiGiallonardo, the 2009 Foothill League 1,600-meter champion, and Canyon's Sam Willis, the Foothill League runner-up in the 2010 1,600-meter final. None of them won. The 2010 title went to Saugus' Logan Smith, who outlasted the field to win the first and only varsity race of his career. Teammate Pion earned the silver and DiGiallonardo took the bronze. Saugus claimed their fifth Foothill League crown in a row as well. This was just the start of Kaylin Mahoney's junior season, as she won her second consecutive individual crown over teammate Karis Frankian. The defending division two state champion won in 17:09, one second ahead of Frankian, with Stephanie Bulder securing a Saugus podium sweep for the third year in a row. The West Ranch trio of Jennifer Owen, Bailey Miller and Ashley Welker took fourth, fifth and seventh, but the Lady Centurions put all seven runners in the top 15 to claim their fourth straight title. For senior Miller, her fifth place finish matched her finish from her freshman year three years before and was the fourth consecutive top eight finish of her stellar career. In the boys final Seth Totten claimed the first individual league title in Golden Valley history, an improvement from his close runner-up finish in the 2008 final. His winning mark of 14:46 is still the fastest time recorded at Central Park, regardless of course, and was a staggering 26 ahead of Canyon's Tommy McGuan. Those two were followed by sophomores Sam Peckham and Kristian Martinez, with the Saugus trio of Robert Pion, Logan Smith and Alec Nelson claiming the last three first team awards. Two wins in the first two meets helped Saugus win their fourth straight league crown, although Golden Valley defeated them in the final, their first win in a league meet in school history. The most dominating performance came in 2008, when the Saugus girls pulled off another first at Castaic Lake. On that day, the two-time defending Foothill League, Southern Section and state champions went 1-7 against a very good field. Running in warm conditions, the varsity squad was brilliant throughout the three-mile race, with all seven passing the mile between 5:40-42 and two miles between 11:57-12:11 (the best team race I've ever witnessed!). On two-time top five finisher Bailey Miller, who clocked 18:18 over 5K two weeks earlier, seperated the sea of blue. In the end it was Kaylin Mahoney, the 2008 frosh/soph champion, winning, with teammates Brianna Jauregui and Annie Randall giving chase in second and third. The duo of Stephanie Bulder and Keri Molt rounded out Saugus' scoring five and a new course record of 89:01, with Amber Murakami and Courtney Wilson finishing well for the "Magnificent Seven." Before the Lady Centurions put on a clinic in the varsity girls final, Saugus' Brandon Jauregui and Golden Valley's Seth Totten got the crowd going with a dramatic finish, which saw Jauregui, a three-time league runner-up in cross country and track, take a wrong turn heading into the last 50 meters of the final. It was Jauregui's race to lose, as the senior came off the final hill with a clear lead, but turned into the middle strip of the parking lot, giving Totten the lead. For the first time in his prep career Jauregui found a kick, going from a complete stop to an all-out sprint with less than 50 meters to go. Jauregui would catch and edge Totten by thirty-four hundredths of a second to win his first and last Foothill League crown in 15:21, an SCV record at Castaic Lake. Teammates Alec Nelson and Joey Eledge gave Jauregui a 3-7 finish to help Saugus to their third consecutive league crown, with Canyon's Anthony Pizzo, Tommy McGuan going 4-5. In the girls final, Saugus became the first program in Santa Clarita Valley cross country history to sweep the top five spots, led by Katie Dunn's solo 17:54 SCV record at La Cresenta Valley Park. Dunn's win marked the third consecutive top four finish of her career, following a third place finish in 2005 and fourth place finish in 2006. Teammate Annie Randall, Nina Moore and Brianna Jauregui, as well as West Ranch's Bailey Miller, formed a quartet that ran together for a majority of the race. Randall, Moore and Jauregui would go on to finish 2-4 with sophomore Amber Murakami overtaking Miller in the final 600 meters to give Saugus a perfect score. Miller finished sixth, her second top five of her career, with Canyon's Hayley Parkinson rounding out the top seven. In the boys final, three Foothill League runners - Hart's Jimmy Kelley, Saugus' Brandon Jauregui and Valencia's Cody Massie - battled over the first half of the race. Both Jauregui and Massie took turns leading through halfway, until Kelley took a commanding lead and went on to win his second Foothill League individual crown of the year (won the 3,200-meter title in a kick over Jauregui six months earlier). Both Massie and Jauregui suffered greatly over the remainder of La Cresenta Valley Park's challenging course, fading to sixth and 12th over the final mile of the race. Saugus' Andrew Lang, Alec Nelson, Baxter Frick and Joey Eledge picked up for their No. 1 runner by taking spots 2-5 to give Saugus 26 point and its second consecutive league title on Halloween. The 2006 girls final was very much the same as 2006, where Saugus' Shannon Murakami, then a junior, dominated. In this final, Murakami won her second consectuve individual championship over two-time champion Brooke Russell, ending an illustrious career, which saw her claim four top three finishes. Russell earned her third top two finish in four seasons, with Murakami's freshman sister, Amber Murakami, taking the bronze just ahead of teammate Katie Dunn. Rounding out the All-Foothill League first team roster were West Ranch freshman standout Bailey Miller, Saugus sophomore Keri Molt and Canyon junior Wendy Cohen. With four in the top six, Saugus ended Canyon's record 12-year streak of team league championships. They would go on to win their first section championship since 1975 and the school's first-ever state championship. 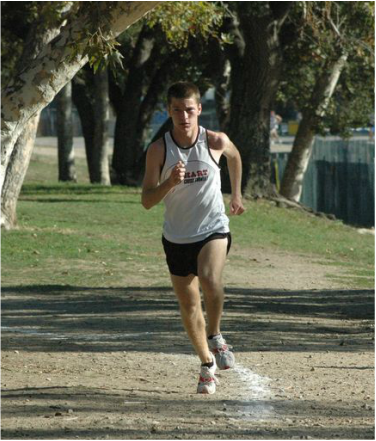 The 2006 boys final was Stephen Kent's golden moment in his running career, as the Canyon senior defeated the Foothill League Meet #1 winner Brandon Jauregui of Saugus and winner of Foothill League Meet #2 Jimmy Kelley of Hart. In this final, most of the field stayed together through the mile marker. Kent, then made a big move, which Jauregui only responded to. Kent held a sizable lead over Jauregui through the next mile and half before the Saugus sophomore bridged the gap and pulled into the lead. The two hit the top of the big hill marking 300 meters to go, where Kent went on to win by seven seconds. Jauregui was second, with teammate Matthew Bosnoyan surprising the field in third, which helped the Centurions defeat Canyon 45-50 and tie for the team crown, its first since 1998. Matthew Hall and Matthew Phares finished 4-5. Saugus' Shannon Murakami made sure she won this one after Brooke Russell beat her in the 2003 and 2004 finals, and teammate Katie Dunn beat her in the opening league meet of the 2005 season. Her winning mark of 18:21 easily beat Canyon's Brenda Cohen by an extraordinary 61 seconds, the biggest margin of victory in Foothill League history. Teammate Dunn finished third, despite nagging knee injuries, however, Canyon's depth was just too much to hand, as the 11-time defending champions made it 12 in a row with an impressive 3-4-5-6-7 finish to claim the 2005 championship with just 24 points. Hart's Alfredo Coronado continued to impress by winning his third Foothill League race in a row and first individual championship of his high school career. Saugus' Derek Somerville, a 2005 CIF qualifier over 400 meters, chased Coronado all the way to finish, but ran out of gas at the end. Coronado would go on to defeat Somerville, 16:31-16:39, the only two sub-17-minute marks of the day. In the team competition, Burroughs defeated Hart, winner of the first two league meets, and tied for league crown by going 2-3-4 up front. Hart's Sean Frohling and Canyon's Stephen Kent also went 6-7.